Studio Line: Paramount Home Entertainment - The heat's back on! Axel Foley (Murphy) is back -- back where he doesn't belong! He's going "deep, deep, deep undercover" into this chic wilds of Southern California, unleashing his arsenal of blazing gunfire and rapid-fire gags against a gang of international munitions smugglers. DVD: Widescreen 2.35:1/16x9; audio English Dolby Digital 5.1 & Dolby Surround 2.0, French Dolby Surround 2.0; subtitles English; closed-captioned; single sided - dual layered; 13 chapters; rated R; 102 min. ; $24.99; street date 1/29/02. Supplements: “Beverly Hills Cop 2: The Phenomenon Continues”; Original Behind the Scenes Featurette; Deleted Scene With Tony Scott Introduction; “Shakedown” Music Featurette; Theatrical Trailer. As I noted in my review of Beverly Hills Cop, 1984 marked a great year for Saturday Night Live alumni, as at least one former castmember appeared in all three of the year’s top-grossing flicks. Not surprisingly, each of those films produced a sequel, and it may be interesting to investigate the fates of those features. Two of the three wouldn’t appear until five years later in 1989. Indiana Jones and the Last Crusade came after Indiana Jones and the Temple of Doom, which itself was the first sequel to 1981’s megahit Raiders of the Lost Ark. Though Crusade didn’t outdo the original’s $242 million, its $197 million did top Doom’s $179 million. That series has the weakest connection to SNL. Dan Aykroyd did a cameo in Doom, but otherwise none of its alumni have appeared in any of the films. The biggest hit of 1984, Ghostbusters, had the strongest link to the TV show. It included two of the program’s most successful alumni, Bill Murray and Aykroyd. (Interestingly, it also had a big connection to SCTV, as both Harold Ramis and Rick Moranis first emerged through that vehicle.) Ghostbusters II finally made it to screens in 1989, but unlike Crusade, it didn’t top its predecessor. In fact, the sequel’s $112 million wasn’t bad, but it marked a pretty substantial drop from the first film, and II was seen as a disappointment. 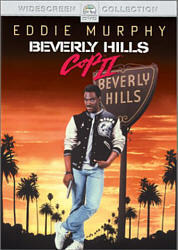 On the other hand, the final sequel under examination, 1987’s Beverly Hills Cop II, offered a pretty solid hit. Only about two and a half years separated the December 1984 release of the first Cop and the May 1987 emergence of Cop II, and the audience’s fresh memories of Axel Foley and the gang likely helped make it a success. Cop II snagged a reasonable $153 million, which placed it third for 1987; an unspectacular year at the box office, Three Men and a Baby won with $167 million, which Fatal Attraction narrowly edged out Cop II for second place with $156 million. While it fell considerably short of the take enjoyed by the first flick, Cop II still qualified as a hit, even though it seemed like a flawed one. At the start of this one, we see a daring jewelry store robbery in Beverly Hills led by an Amazonian platinum blonde we’ll later learn is named Karla Fry (Brigitte Nielsen). We also watch our old friend Axel Foley as he’s up to some of his usual tricks. He meets up with some low-lifes as part of a running sting operation. This requires him to drive an expensive car and wear fancy suits, even though both seem like they’re very out of character for the earthy Axel. However, they did match the increasingly narcissistic Murphy’s self-image, which is why they exist in the flick. Anyway, Axel has a fishing trip planned with his former partners from the Beverly Hills police force. After his unlikely increase in fashion sense, this marks improbable leap number two. While a certain bond had developed among the men by the end of Cop, the prospect that they continued to socialize on vacation afterward appeared unlikely. Actually, I could buy it if the film just stuck Axel together with Taggart (John Ashton) and Rosewood (Judge Reinhold), but it also made Bogomil (Ronny Cox) an integral part of the friendship; Foley even now has close ties to Bogomil’s daughter! If you’re thinking, “daughter? What daughter?” then you’re not alone. Jan (Alice Adair) made no appearances in Cop, probably because her name should actually be “Plot Device”. You see, Bogomil cancels the fishing trip due to his ongoing investigation of what’ve been dubbed the “Alphabet Crimes”. That’s because prior to the individual actions, the crooks send the cops a note with a letter on the front of each. This begins with “A” and then has the audacity to go to “B”. Not sure what follows that - I knew I should have paid more attention in Kindergarten! Anyway, their deeds relate to the letters involved, which gives the police some form of forewarning about what to expect, but not much. (If you’re wondering why criminals other than Batman Forever’s Riddler would bother to provide such advance notice, there is a logical reason, though we don’t discover this twist until near the end of the film.) Apparently Bogomil’s investigation garnered him too much information, for early in the flick, they try to ice him. As we learned in the first Cop - and will learn again in the third film - a vengeful Axel Foley is a powerful force. When he discovers that Bogomil barely escaped death, he immediately goes “deep undercover” and jets to California to assist his cohorts. Complicating the process is a new police chief, and this one - played by Allan Garfield - is even more of a prick than the dude from the first flick. When Rosewood and Taggart overstep the bounds of their authority, he demotes them to traffic duty, so along with Axel, they have to tread lightly during their investigation. From there the rest of the movie follows their attempts to get to the bottom of the villains’ plans. Pretty quickly Axel figures out that an oily dude named Maxwell Dent (Jurgen Prochnow) runs the show. This allows him to subject the antagonist to the usual public humiliation that quickly became part of the Axel Foley MO. Bullets fly, cars crash, Axel outsmarts a bunch of people - it’s a pretty predictable affair for the most part. It’s also reasonably enjoyable, though it doesn’t remotely approach the highs of the first movie. With the release of his absurd musical album How Can It Be? in 1985 and the self-absorbed box office disappointment The Golden Child in 1986, Murphy clearly had begun to believe his own hype. The Eddie of 1984 still worked for a living and had something to prove, but after that, he surrounded himself with sycophants and went into a terrible slide. Cop II is part of that decline, but he hadn’t fallen too far just yet. However, this movie’s Axel often felt wrong to me. The flick tried to explain his new-found fashion sense by positing it as part of the sting operation, but despite a scene in which Axel laughs at himself in the mirror, it’s very clear that Murphy’s digging the new wardrobe and other accoutrements. He still wears the same crummy T-shirt, but here it’s largely hidden beneath a fairly snazzy Detroit Lions jacket; it may not be high fashion, but it definitely makes Murphy look a lot slicker than he ever did in the first movie. Even Axel’s crappy blue Chevy Nova takes a powder in the sequel. Of course, he flew to the coast this time, so obviously he had to rent a car, but had they remained true to the Foley non-materialistic ethic, he should have gotten something cheesy. Instead, Axel tools around in a pretty snazzy vintage convertible. These elements don’t beat you over the head, but they sum up to a new attitude for Axel, and they don’t seem to fit with what we already knew about the character. He started to turn more into a slick James Bond sort rather than the old street-savvy scammer. That trend would reach its nadir in Cop III, whereas the first sequel largely kept these moments within appropriate limits. The other characters also suffer from artificial alterations. We learn that Taggart’s wife has left him, which is really the only piece of personality exposition that makes any sense. Unfortunately, this element remains left without much discussion, so it feels like little more than detail for detail’s sake. Rosewood turns out to have a serious internal rage problem, and that’s a real stretch for the nice boy we came to know in the first flick. Oh, I guess we could see him as one of those Columbine kids in a way, and the original movie strongly hinted that he’s a bit wimpy but wants to take charge. Nonetheless, I didn’t buy his newfound fascination with heavy weaponry, and the film started to make him out to be a psycho, which just isn’t right. Still, they emerge more positively than Bogomil and his daughter Plot Device. Cox barely registers as a cameo in the flick, and Adair doesn’t show up much more frequently. Essentially she exists so Axel can obliquely obtain information about her dad’s investigation. That’s it - she has virtually nothing else to do in the movie other than give us a sad face to justify Axel’s attempts at revenge. Ironically, although all three Cop flicks feature a vengeful Axel, only the first really made us believe this motivation. Foley’s desire to find the murderers of his friend Mikey remained a constant subtext, and we truly bought that notion since Murphy aptly communicated his ire. No such material exists in either of the sequels. Frankly, nobody really seems that upset about Bogomil’s injury, and the killing in Cop III that initiates Axel’s quest appears almost totally forgotten after a few minutes. I suppose Nielsen did what she did well, but the fact remains that once I see that frigid puss of hers, I know that the movie will seem like a period piece. Cop II doesn’t escape that fate, though I must admit that some of her scenes are among the film’s most effective. Tony Scott - fresh off Top Gun, the biggest hit of 1986 - displays much more talent for action than for comedy, so those elements of Cop II often seem the most satisfying. The Alphabet Crimes themselves offer some very solid moments. Unfortunately, no one goes to see a Cop flick for the action, so the comedy sequences suffer to a certain degree. As a whole, Cop II seems like a fairly generic rehash of the first movie, and many similar gags see repetition. Little about it comes across as inspired or creative, but some parts of it still work reasonably well. Despite his post-1984 decline, Murphy hadn’t totally lost it by 1987, and he still showed some of his old flair and spark that would soon evaporate (at least until he reclaimed his career with 1996’s The Nutty Professor and his resurgence over the past few years). No, this isn’t the same sly and winning Axel we liked in the first movie; he’s much more smug and condescending. Nonetheless, he retains enough life and charm to create some entertaining moments, and although the chemistry among Murphy, Ashton and Reinhold has faded since 1984, it still maintained enough strength to add some value to their scenes. I watched all three Cop films in chronological order, but to reap the most benefit, I should have viewed them in the reverse manner. The God-awful Cop III still would have sucked, but it’d look less rancid without the fresh memory of its predecessors. Cop II would then seem much stronger by comparison to Cop III and without the immediate connection to the first one. I could then have wrapped up with the original and ended on a happy note. But I didn’t do that, so I’ll have to retain my thoughts of Beverly Hills Cop II as a sporadically entertaining but flawed and fairly mediocre comedy. It manages to seem reasonably entertaining for most of its running time, and it never really falls on its face, but the thrill clearly was gone, and at times it feels more like corporate product than anything else. Beverly Hills Cop 2 appears in an aspect ratio of approximately 2.35:1 on this single-sided, dual-layered DVD; the image has been enhanced for 16X9 televisions. Though not without some concerns, Cop 2 largely looked quite good, as it offered the strongest visual experience of the three films. Sharpness consistently seemed positive. At all times, the movie remained crisp and well defined. I detected no concerns related to softness during this accurate and detailed picture. Moiré effects and jagged edges also caused no problems, and I witnessed no signs of edge enhancement either. Print flaws created some minor concerns, however. A few scenes seemed somewhat grainy, and a mild mix of speckles and grit also popped up occasionally. However, these remained pretty modest and didn’t intrude on the presentation to any significant degree. Colors came across as accurate and vivid. For the first film, hues suffered from that moderately muddy look that affects many Eighties flicks, but those issues didn’t occur during Cop II, which offered consistently vibrant and rich tones. Black levels also appeared deep and dense, and shadow detail looked appropriately thick but not excessively opaque. The latter area marked a significant improvement over the first Cop, as the original was very poorly lit for Murphy; he was barely visible in many scenes. Cop II fixed that problem and offered a pleasing visual experience across the board. While the Dolby Digital 5.1 soundtrack of Beverly Hills Cop II wasn’t quite as good, it still seemed satisfying for its age and it largely improved upon the audio heard in the first movie. The soundfield of Cop II provided a moderately more involving piece. As was the case for the original, the audio remained largely oriented toward the forward channels. In that domain, music showed reasonable stereo imaging, and effects appeared well placed in the spectrum. Those elements moved across speakers neatly and seemed to blend together to a positive degree. Surround usage still seemed mainly restricted to general reinforcement of the music and effects that came from the front, but the rears definitely played a more active role in the presentation. They popped to life acceptably well during the action sequences, and they complemented the forward track to a decent degree for an older film. Audio quality generally showed improvements over the sound for the first movie, but this didn’t occur in all areas. Speech seemed acceptably natural and distinct, and I heard no problems related to intelligibility or edginess. Distortion remained a minor problem for some effects, as gunfire and explosions still showed moderately shrill tones. However, for the most part, those elements seemed reasonably clear and accurate, and effects occasionally demonstrated some pretty good depth. Unfortunately, bass response appeared somewhat weak for the movie’s music, which marked the only small downturn from the audio of the first film. In Cop, some of the songs sounded a little muffled, but they all showed fairly strong low-end presence. The music for Cop II seemed less warm and rich. Dynamic range wasn’t poor as a whole, but I thought the bass could have been deeper and more active. Nonetheless, the soundtrack for Cop II still was quite satisfying for a film of its vintage. Beverly Hills Cop 2 doesn’t include as many supplements as did the DVD for original flick, but it tosses in a few pieces. First up is a new documentary called Beverly Hills Cop: The Phenomenon Continues. This 22-minute and 10-second program mainly offers film clips and interviews; a few shots from the set also appear, but those are brief and minor. In regard to the interviews, we get new chats with director Tony Scott, editor Billy Weber, producer Jerry Bruckheimer, and actors Judge Reinhold, John Ashton, Ronny Cox, Jurgen Prochnow as well as a quick snippet with Hugh Hefner from set. Overall, the documentary seems pretty lightweight, but it provides a reasonable amount of information. It also comes across as fairly entertaining and engaging as we learn a few good tidbits about the production. Its greatest fault stems from the absence of Murphy. I don’t know why he didn’t participate in any of the extras for the three Cop flicks, but without him, the pieces feel very incomplete. At least we hear from him in the original behind the scenes featurette. In this seven-minute and five-second piece, we hear from producers Don Simpson and Jerry Bruckheimer, director Scott, and actors Cox, Reinhold, Ashton, Hefner, and Brigitte Nielsen (when she was Brigitte Nielsen-Stallone). Although clearly intended to promote the movie, this program actually includes some good material, mainly due to the variety of fun snippets from the set. It’s also nice to see Murphy, and he tosses in some entertaining comments. It’s not a great feature, but it’s better than most of its ilk. Next we discover a deleted scene with Tony Scott introduction. Scott’s lead-in takes up the first 58 seconds of this three minute and 18 second piece; a short snippet from Judge Reinhold rounds out the clip, so the cut sequence itself runs about two minutes. Presented full frame, the segment is vaguely interesting but the film doesn’t suffer for its loss. Scott tells us why it didn’t make the cut, so his comments are worthwhile. In addition to the film’s theatrical trailer, we find the ”Shakedown” Music Featurette. This five-minute piece shows some of the process behind that song. We see Bruckheimer in new interview footage as well as archival clips of him and co-producer Simpson along with music composers Keith Forsey and Harold Faltermeyer. Those two discuss their thoughts about movie music and working with Simpson and Bruckheimer, and we also watch all four groove to the song in the studio. Frankly, this isn’t a very interesting or informative piece. When one thinks of generic, cookie-cutter sequels, an image of Beverly Hills Cop II might come to mind. To be sure, it’s definitely not a bad piece of work, as it offers a moderate amount of fun and excitement. However, it is relentlessly average, and it suffers from the same lack of ambition and creativity that mars many sequels. The DVD offers consistently positive picture and sound as well as a minor roster of acceptably interesting extras. Beverly Hills Cop II doesn’t match up with the original, but it should be interesting for Eddie Murphy fans.